Alberto here. It’s my favorite day of the week as I get to share with you some of the fantastic feline related things I’ve found on the web. Without further ado, here is this week’s #WalkThroughTheWebWednesday selections. This made my human smile, and me, as well. I think it’s a great idea to receive messages from your human throughout the day. Marc from Katzenworld reports on one of the most amazing cat cafe’s in Japan. Humans, pay close attention to this one. The human writer here nails it! The Daily Cat-Is Grass Healthy For Your Cat? The Tribe of Five are grass aficionados and I was very interested to read what The Daily Cat had to say on this subject. As those of you who follow our blog know, we are a mewsical bunch. Imagine my surprise and delight when I found this site by Alfra Martini that features “legendary albums from a world dominated by kittens.” Rock on! Well,. that’s it for this week. Remember, if you find something you think is “Wednesday Worthy” send me a link and I’ll have my purrrsonal assistant check it out for me! Oliver here. I recently brought to the attention of the female human that we had not completed our Catio report. She reminded me that we had to wait quite a while for the second part of our purchase so I guess I’ll have to cut her a little slack. The good news is, part two arrived and Alberto and I (and even Jasmine) got to take it for a “test drive” on the upstairs deck. (If you’r wondering why :I said “even Jasmine”, you can learn more about her story here. 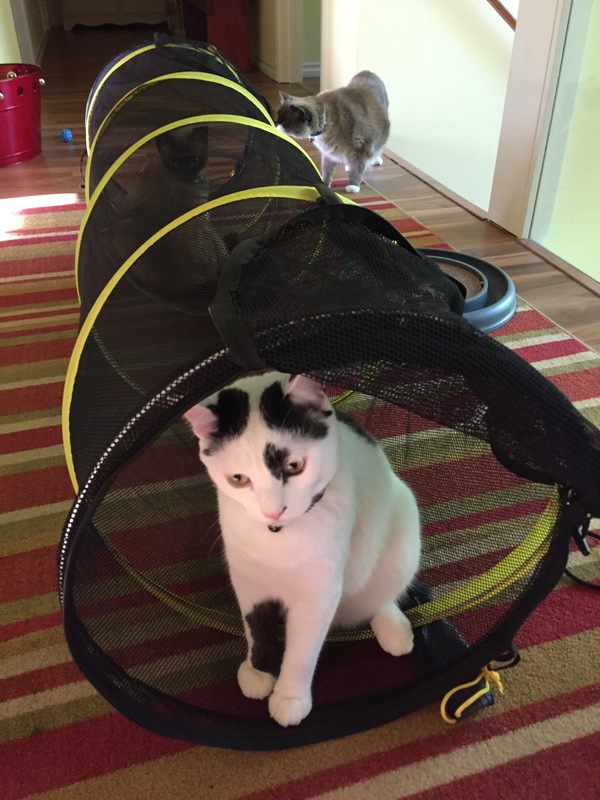 If you haven’t read the first part of our catio post, I’d recommend you do, as this post will then make more sense to you. But, back to my report, we couldn’t see what awaited us in the new box. As soon as the box was on the floor, I appointed myself inspect-purrr. I couldn’t tell much from sitting on it and, since I can’t read, I figured I’d wait for the humans to take out whatever was inside for me to inspect. Evidently the female human didn’t appreciate my sitting on the box so she made the male human hold it up so you can read the information on the front. Things finally got interesting when they opened the thing up. There was a bag with a “netty” thing in it. When the humans unhooked the side thingies it popped open. Alberto and I ran under the dining room table and waited until we felt it was safe to resume our inspection. 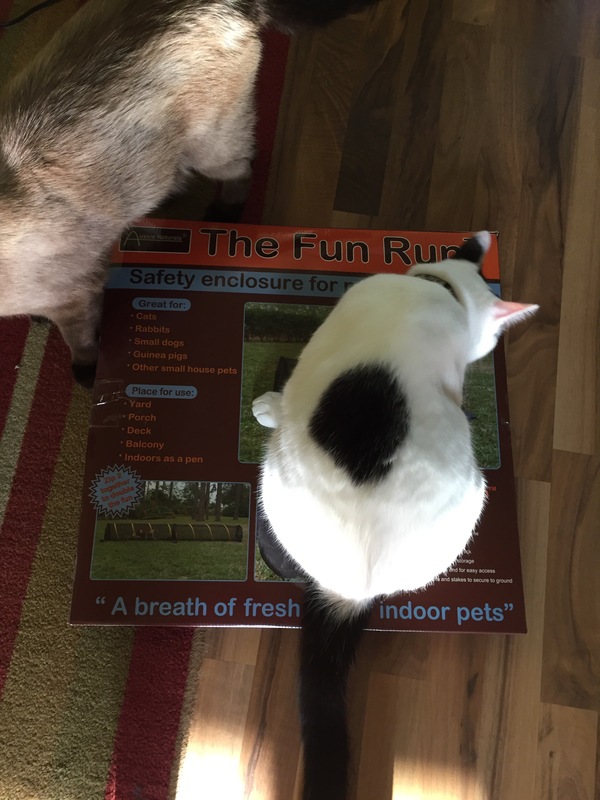 I must say I’m amazed that the entire “fun run” flattened out so well to fit in that box. By this time, a small crowd had gathered. Tucker, our Alpha, strolled over in his usual stately manner but when he realized no treats were involved in this operation, he strolled back to his comfortable perch on the chair. 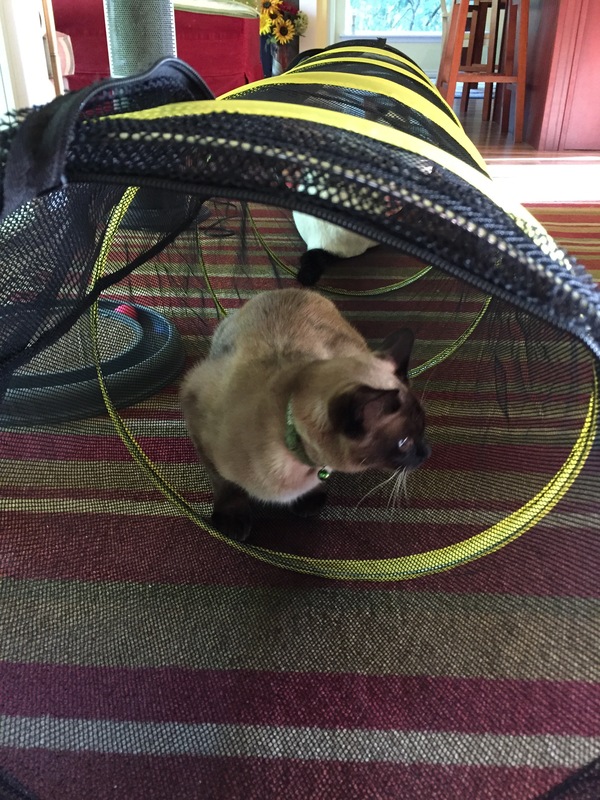 Alberto, my brother, is just as curious as I am so he made sure to give the tunnel his full attention and purrrsonal inspection. Lily sniffed, walked around it and then dismissed it as something that didn’t interest her. The humans moved some of their stuff out of the way and set the tunnel up to check out the size and to see what we felines thought about the whole thing. 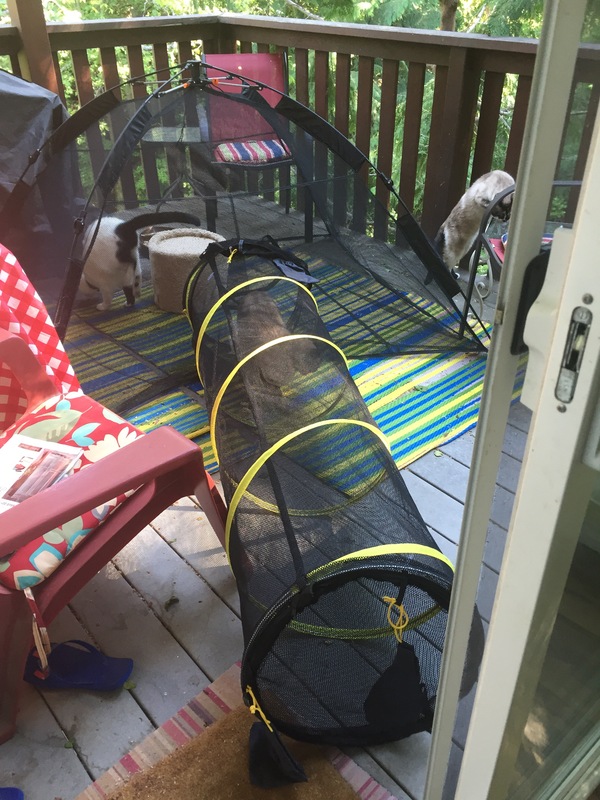 Their plan was to fit the tunnel into the door of our Happy Habitat catio tent to allow us access from the house to the outside. Al and I took great care in checking everything out, as you can see from the photos. 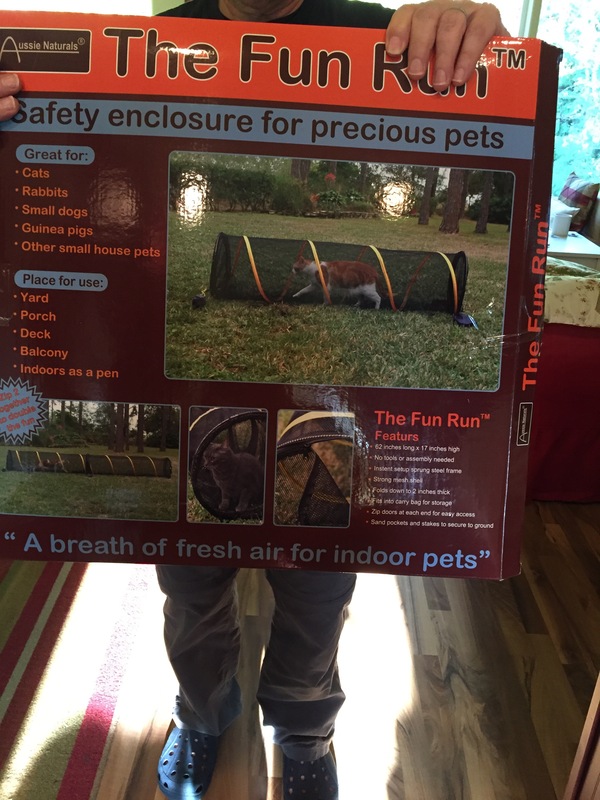 We gave the “Fun Tunnel” a paws up and waited with anticipation for the humans to put it outside for a real testing. This weekend was the day. The female human moved some of the furniture on the deck to make room for our set up. Everything , was ready quickly with our Happy Habitat tent and the tunnel. It took her a little time to coax us into the thing but pretty soon we figured out that this was pretty cool habitat and provided even more room for us to roam around on the deck. We love the cat furniture the human added and Alberto and I spent several hours watching birds and squirrels at the feeder, and, when we tired of that, we stretched out for a snooze in the fresh air. All in all it was quite an adventure. Tucker came by but when the female human invited him into the tunnel he turned around and hustled back to his inside perch. Jasmine (Tucker’s sister who is still afraid to come out of the bedroom, was lovingly carried to the catio and she spent some time in the tunnel. She never was comfortable enough to walk into the Happy Habitat but the human thinks it’s only a matter of time until she’s ready to do that. All in all, we give this new addition to our outside experience two paws up. 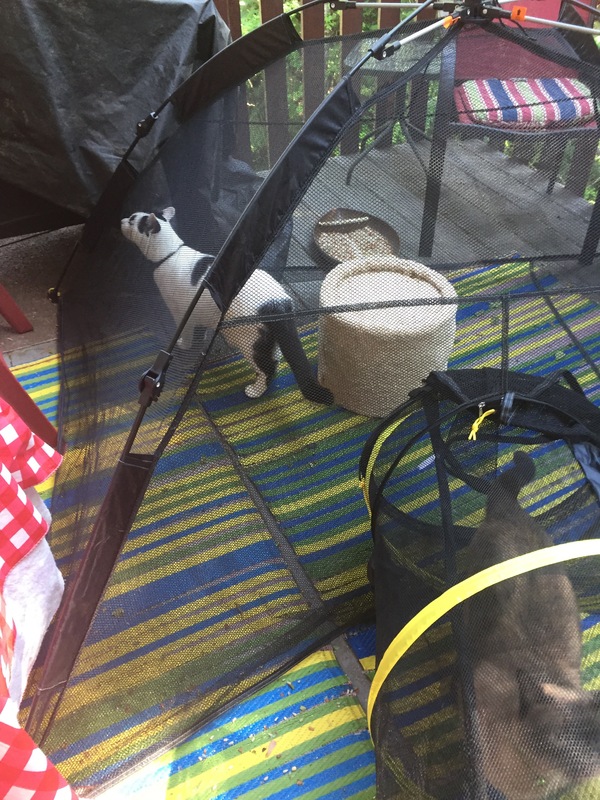 The humans like it because they can set it up quickly and easily and, since it’s portable, they can let us enjoy the upstairs deck, the front porch or garden or even the downstairs patio with the water fall and pond. So, we may not be true traveling kitties but we feel like we’re having a vacation when we’re outside in our catio! The female human loves it too because we can enjoy the outside without giving her a heart attack by jumping up on the edge of the deck (yes, one of us plunged over 35 feet down into the ravine-twice and someone else took a dive from the first to the second floor in the house) Tucker blames his incidents on his bad depth perception due to his cross eyes. I have no excuse except that I was just an irresponsible kitten. The female human cannot sit comfortably on the upstairs deck any more unless we are all safely in our catio. Fear free living isn’t just for the felines, it applies to the humans too! Have your humans check this out. If they do, I’d recommend that they hang a bird feeder somewhere close so you can enjoy the show. Tucker here . As you can see, not all my friends are able to attend the Linky Party but I sure hope you will. As the host this time, I got to select my favorite posts from the last Party , ‘hope you enjoy these and join us for this new pawty with me, Tucker as your host! I love this post from Heart Like a Dog because it touched my heart and because I just turned twelve myself! Happy belated birthday Sampson! You may think it’s strange that a cat chose a lost bird post as his pick but I do like birds. Always watch them on our upstairs deck and always ready to extend the paw of friendship. I picked this post because the female human and her sister created a local lost pet organization called Bonner County Critter Finders . These folks use social medial to hep people locate their lost pets. They even had a bird listing once, so, in honor of our female human I chose this post that offers some great information. Now, we felines are not too keen on travel however there are many felines who are and, although this is a piece for canines, I would suggest that all you humans with felines in your home consider a little trip somewhere, even, as in our case, it’s just on the front porch in our Happy Habitat tent. And, by the way. 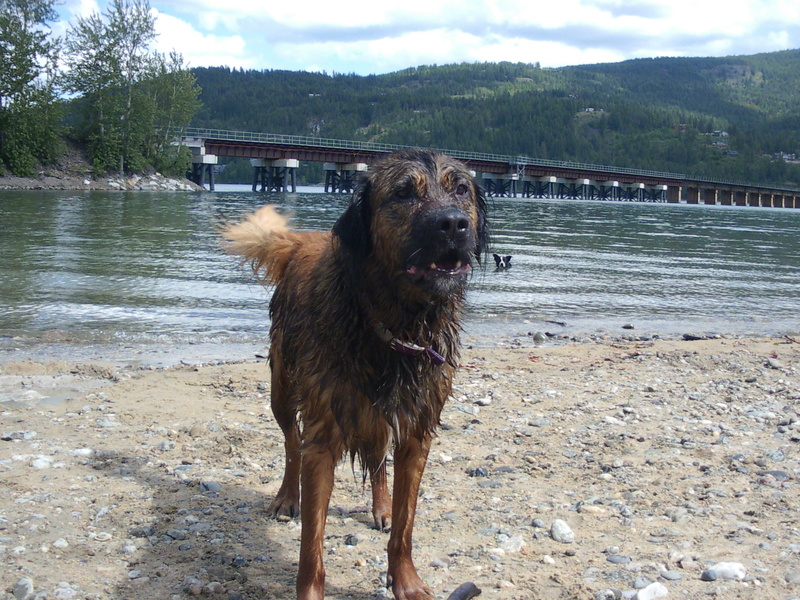 We live in a tourist area and there’s a location that was not included on that list and that is Dog Beach at our own Lake Pend Oreille. Pretty cool, a beach for dogs, you should check it out! Alberto here to introduce our first “Walk Through the Web Wednesday”. 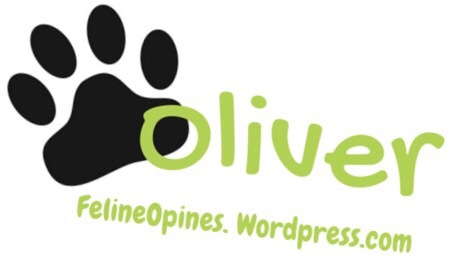 Each Wednesday one of the Tribe of Five will host this feature of feline news, photos, information and shenanigans that we like. For our first segment I want to remark about National Black Cat Appreciation Day (which is today). There was once a beautiful black cat in our tribe. I never met him, he crossed over the Rainbow Bridge four years ago but Tucker and Jasmine knew him and they still miss him. His name was Buster and they tell me Buster was an easy going, loving and handsome guy. I had my purrrsonal assistant dig out some photos in his honor. RIP Buster.Tucker, Jasmine and the humans still miss you very much. If you want to know more about Buster, the female human wrote about him (and the rest of us) in her story , “All My Children Wear Fur Coats” in Chicken Soup for the Cat Lover’s Soul, My Very Good, Very Bad Cat. And now, (drumroll please) my favorite Walk Through the Web finds for the week. Vacation Planning Tips for Cats from Fully Feline. Don’t be confused, this is not an article for humans about how to stuff us in those carriers that you normally use to take us to the people in the white coats. This is an article about and for cats and how they can plan their vacations. (Yes, we may sleep all day but we still deserve a vacation). These tips come from The Devious Book for Cats: A Parody (however I find no parody there but only sound advice for my feline friends!) I myself am planning my next vacation foray to a natural wonder, the guest room toilet. The human at LukeCats wrote the most beautiful piece to accompany and amazing black and white feline photo. I always applaud humans who understand our deep and delicate nature. The Tribe of Five lives in a canine free environment but I’ve had discussions through the window with neighboring cats when they stroll by and many of them live with canines. I’ve heard talk about those “mean pit bulls” but have never met one. Three Chatty Cats wrote an article about a new foster-based rescue group located in Lee’s Summit, Missouri that focuses on pit bulls and cats. Now we felines get a bad rap because of our breeds (people have said to my humans, “Oh, a Siamese, don’t they yell a lot?”) so I am not disposed to dis any breed without knowing all the facts. So, the female human came home from the #BlogPaws conference in Arizona and could not stop talking about a cat she met there named Coco, who had the most amazing outfits. Frankly, I was a bit weary of hearing about this cat, “She was so sweet, she never freaked out in a crowd. She let anyone pet her. She had the most amazing outfits…” blah, blah, blah. So, imagine my surprise (and shock) when, while scratching around for Walk Through the Web Wednesday listings, I found this blog post (which is admirable and important in it’s content ) but which features the couture feline sans clothing….not a stitch! I was flummoxed. The fanciest feline on the web without her trademark ensembles. I suppose appearing sans designer duds makes her a bit more approachable for the rest of the cat world who do not make it a habit of sporting fancy ensembles. Well folks, that’s my Wednesday Walk Through the Web update for the week. If you have something you think the Tribe of Five would like to opine about on our Wednesday feature, leave us a comment and we’ll check it out. Who knows maybe you’ll be featured one of these days. Alberto here (but you can call me Al, all my friends do). Today I wanted to write about the strange fixation the male human has for this thing he calls a gee-tar. The male human has a very nice mewsic room downstairs (which, by the way none of the Tribe are invited to visit) but he often brings the gee-tar upstairs and strums it while he sits on the sofa. I am not a cat who easily takes no for an answer so I figured I’d hop on top of the human and get a closer look at this gee-tar thingy that he found more interesting than me. At first glance, I was not impressed. Evidently the female human is not impressed with the gee-tar because she often complains about the male human “twanging” on the thing when she’s attempting to watch the moving images in the big flat box in the living room. The male human did not pick up on my polite hint that I needed his attention so I decided to focus some more attention on his gee-tar. As I came in closer, I noticed that the string things moved when he plucked at them. Could this be some wonderful new cat toy? Is it possible that the human brought this thing upstairs for my amusement and edification? Hmm, maybe I was a bit to fast to jump to judgment. I leaned in, lifted my lips back and got one of those string things in my mouth. Just as I was getting ready to pull it, I found myself unceremoniously dumped off the humans lap and onto the floor. Can you believe it? The human does not honor the code of the house and make room for me on his lap and then, when I am attempting to assist him, he dumps me on the floor. It took me a few moments to recover from the indignity but I am a jovial fellow and prefer not to let conflict into my life. After giving myself a good wash, I hopped into the chair where the female human was sitting. She understands the rules of the house quite well and petted me and told me what a handsom guy I am. Finally, after receiving enough affirmations to renew my self-confidence, I twitched my tail, jumped off her lap and sashayed off to the dining room window to check for birds and squirrels. Oliver here. While the female human was writing Amelia’s Story, the Tribe of Five had an editorial meeting and decided that there is so much fantastic feline information out there that we would make it a regular feature to tell you about something fabulous that we discovered during our purrrrrusal of the internet. Today I bring you a very cool post from our friends across the pond at Katzenworld. Now, before I share this newsflash with you, I want you to hold on to both sides of your litterbox. Are you ready? Okay. Did you know you could have your humans select some of your best photos and turn them into wall murals? Can you imagine the fetching photo of me above, covering the dining room wall (I am fetchingly posing on the dining room rug). And you can fill your walls with designs that fit your decorating style. For instance, the male human loves all things “outer-spacy” and I think this mural would definitely fit his decorating tastes. There’s much more at Katzenworld, so click on the link and find out how you can have purrrrfect home decor.